Now and then we produce a TWiV that is focused on explaining basic aspects of virology. We call this series ‘Virology 101’. All the posts in this series are listed on this page with links back to the original post. If you start from the top, soon you will have a good basic understanding of virology. Repeated listening often fosters better comprehension. For those who prefer reading, there is Virology 101 and Influenza 101 at virology blog. 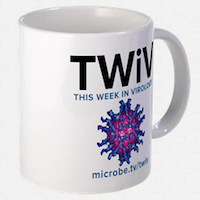 If you have any questions, send them to twiv@microbe.tv. I just discover your website with great Podcast about my field: virology. Because I am back in France and are still looking for a new position in virology and immunology, I appreciate your report on news in virology. I worked at OHSU in Portland OR on Human CMV as Postdoc and learn so much about host and virus interaction. My suggestion would be to cut your Podcast in 40 minutes but edit it each week instead each 2 weeks. Soon I will work at university I will suggest TWiV to my French coworker and students. Dr. Jerome Dumortier, in Rouen France. Great stuff _ I was tuned into this podcast by a colleague and it is really the best science podcast I've found to date. Even though I've done work with viruses all my (admittedly short) career, listening to this just shows me how much more I still have to learn! Well it’s certainly free now in UK. the one I use is Podcasts. I wonder if Dr. Racaniello offers online courses? When is the next course of Virology going to start by Dr. Racaniello? Great website with useful resources than what I have in my university. Looking forward to meet Dr. Racaniello in the future. =) I love virology. Coursera brought me over. Virology 101 is perfect. Great Pod cast. I am hooked. I wish I could be your Mphil or phD student anyhow..
why there is no HCV vaccine?